January 30, 2019. The New Millennium Trail in Calabasas before the mustard overtakes it! 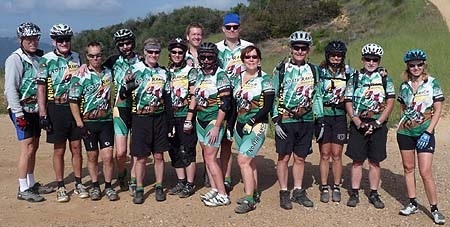 North Ranch Mountain Bikers (NRMB) is the largest and oldest mountain bike riding group for adults in the Los Angeles area. We have rides most every Wednesday night and Saturdays and Sundays year-round on a multitude of trails. 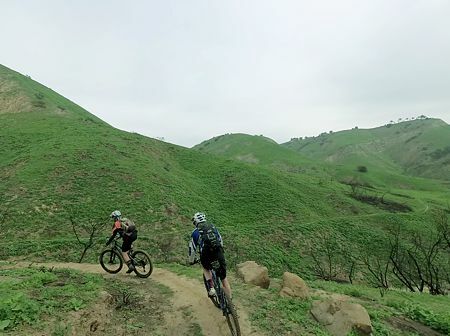 Many of our rides are on trails in The Santa Monica Mountains National Recreational Area (SMMNRA) which spans Los Angeles and Ventura Counties; however, we also regularly ride in the San Gabriel, Santa Barbara, Frazier Park and San Bernardino Mountain areas as well. We even have occasional trips to popular riding destinations such as Mammoth, Kernville, Lake Tahoe, Big Bear, Sedona, Moab, etc. All of our rides are recreational in nature and are not competitive. We have rides for all levels of riders; beginner to advanced, so pick rides that best fit your skill & athletic abilities. A listing of all of our current month rides is available for download from this website. NRMB encourages safe, responsible and courteous trail riding. Helmets are mandatory on our group rides and we expect riders to also bring along their own water, snacks and tool kit to fix minor mechanical breakdowns on the trail. We also highly encourage riders to wear operational walkie-talkies (FRS radios that support privacy codes) tuned to channel 5:25. We expect our riders to adhere to the rules of the trail for the safety and enjoyment of all trail users. I understand and accept that mountain biking can be dangerous and that accidents can result in serious injury or death. I understand and accept that the trails the North Ranch Mountain Bikers ride may not be verified for safety or ridability. I understand and accept that it is my responsibility to determine if my riding skills match the difficulty of the trail we are riding on. I understand and accept that ride schedulers bear no responsibility for my safety on any ride and that I undertake any ride knowing that I and I alone am responsible for my own safety on the ride. I understand that there is no charge for bike rides. In addition to this website, we have both a Facebook Group and a Yahoo e-Group. If you would like to join the e-Group click here to send Tamara an e-mail and she will gladly set you up. If you already belong to the e-Group you can go directly there by clicking here.